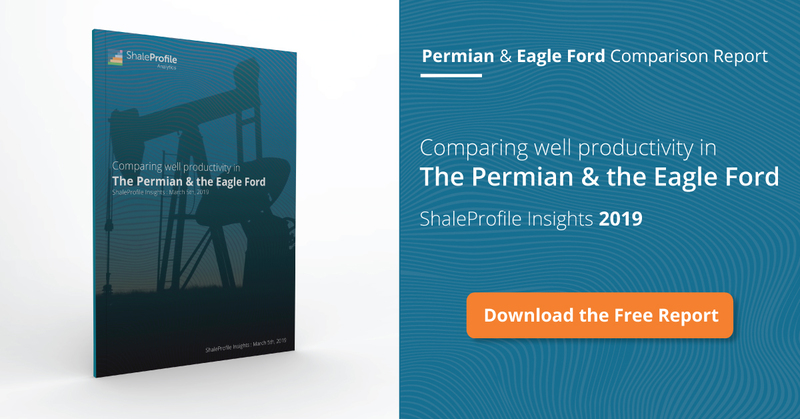 This interactive presentation contains the latest oil & gas production data through March from all 15,294 horizontal wells in the Permian (Texas & New Mexico) that started producing since 2008/2009. Oil production in the Permian has kept its upward trajectory through the first quarter of this year. The percentage growth since mid last year was even larger in New Mexico (50%), than in Texas (toggle the basins in the ‘Basin’ selection to see this). Despite the increase in drilling & completion operations, well productivity has not deteriorated in recent quarters. The ‘Well quality’ tab shows the production profiles for all wells that started in a particular year, and here you can see that on average, recent wells are tracking the performance of wells that started in 2016. Those are on a path to recover ~200 thousand barrels of oil in their first 2.5 years (30 months) on production. In the bottom graph in the ‘Well status’ overview you can see the percentage of wells that are producing at a certain production level. In March, just over 400 wells were producing above 800 bo/d (a new record). The percentage of wells that are producing below 50 bo/d has remained steady at about 50% in the past couple of years. The 4 leading oil producers in this basin are producing at or near record output levels, as shown in the final tab (‘top operators’). If you want to figure out which operator has the best average well results, the ‘Productivity ranking’ tab is a good place to start. Here you can see the ranking of all operators by the average cumulative production over the first 24 months. If you change this measurement period to 12 months, and select only the years 2016/17 using the ‘Year of first flow’ selection, you can see that of the large operators (>100 operated wells), EOG scores the best, with an average cumulative oil production of 207 thousand barrels in the first year for all its 147 wells that started producing in 2016 & 2017 (Jan-April only). Early next week I will have an update on the Eagle Ford, followed by a post on all covered states in the US. We will be present at the URTeC in Houston later this month, so if you would like to meet us, or learn more about our upcoming analytics services, I hope to see you there. Note that a significant portion of production in the Permian comes from vertical wells and/or wells that started production before 2009, which are excluded from these presentations.